25% OFF Now It’s available at Offer Price — $20.21 with Coupon Code “MEDVIVE25“. 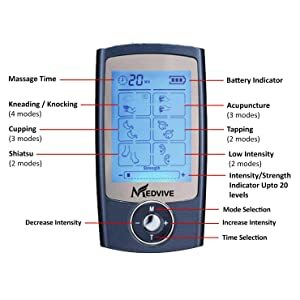 Gurin Products LLC has recently announced the Offer of its Medvive Tens Unit on Amazon to be sold to residents of the United States of America. The Medvive Tens Machine is an upgrade of the previous version of the product, offering an affordable and Smoothly relief from Chronic Pain. The upgraded version is Cleared by the FDA and reiterates the company’s passion to encourage healthy living by offering innovative health care solutions. The tens Unit help in Chronic Pain and Joint pain quickly and accurately. The product allows users to easily and quickly Relief with 20 intensity and 16 modes for different-2 type and part of the pain. This ensures that busy persons like athletes and pilots to can quickly manage their pain and feel relaxed. With a compact and bright nature, the device is portable and lightweight, allowing users to carry it easily anywhere and everywhere. The features of the device make it perfect for persons in Sports and Aviation. The machine accommodates different intensity, ensuring that anyone can use the product regardless of their need. It also comes with long battery life, automatically powering off after 10 seconds and allowing over 30 hours of continuous using on one set of batteries. The package includes Tens Unit, 8 pads, case, user manual, 2-AAA Batteries, plus a no-hassle 1-year warranty and friendly customer service. The offer on Amazon also comes with a 100% Money Back Guarantee for unsatisfied customers. The Tens Unit is available blue colors for as low as $20.21. Gurin Products, LLC is a manufacturer of health care products designed to ensure users maintain a healthy, happy lifestyle. The company manufactures innovative health care products to meet the needs of customers across the globe.